Out of all the 24 billion photos of seen of manicures done with shatter top coats this year, the silver ones always look the prettiest to me which is why I actually couldn’t quite restrain myself from adding this to a recent eBay polish haul. I mean, it’s Color Club… it cost me less than a coffee. I was too much of an impatient child to apply it over anything over than what I was already wearing so it jazzed up the Nails Inc. OMP! nicely. It also reminded me how nice it was to have something to breathe new life into a tired looking mani without having to redo the whole thing. Forty seconds later and I’m getting another 3 days wear from something that should have bitten the dust days ago. Ok, we’re really done with this trend now yah? Just one more? Nooooooo! I want the new China Glaze ones, there’s purple and blue, and I’m also hoping the gold Nails Inc one is going to come out soon (I read about it on BritishBeautyBlogger). Then I’m done, lol. I’m definitely not done with it, I’ve only got black at the moment. I really want a purple one and silver is looking pretty good! I own shatter polishes…I agree though, a bit of overkill now – every colour of the rainbow. I have the OPI silver shatter polish (can’t remember the name). It’s BEA-utiful & will be my go to polish while I’m on my hols. A normal manicure usually lasts me a week with minimal wear…so after my first week of hols I’m hoping a coat of silver shatter and a top coat should see me through for the whole fortnight…fingers crosses. Should be better than the 6 polishes I took with me last year! A good shatter polish can disguise a thousand sins!!! This is so funny, you, my order of black and silver OPI shatters arrived in the post today, these aren’t common in the Philippines and what’s usually new here is what just went out the trend exit door in the Western world since we’re so far away and stocks of this aren’t readily available. I’m sure I’ve read somewhere that they’re not far off – may even be Nails Inc that are doing them?? Quite yummy! Love the colour combo! I have four. This is worrying. I hope Barry M brings out some more colours though. That’s very pretty! And I would so love to see a holographic shatter, that would be awesome! 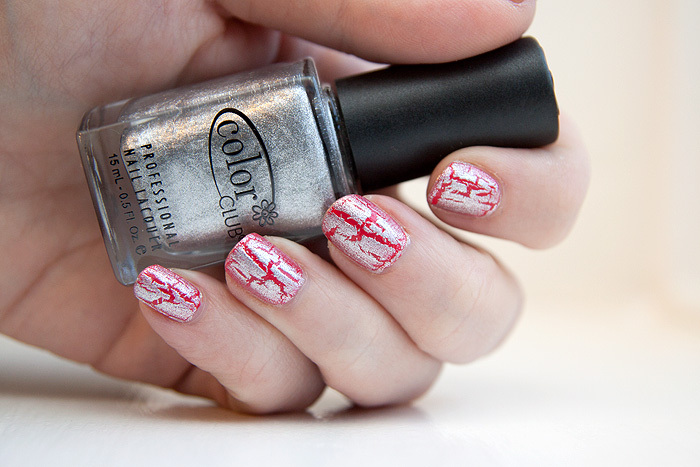 I’d like to say that i’m tired of the crackle trend but I haven’t even tried it yet. I’m so behind when it comes to nail stuff! xD I’ve just started makeup so It’s no wonder. “I never said I was bored of silver ones.” This is the best sentence ever.